The LAS Tubular is named in honor of the most entertaining and exciting cyclocross race in America, CrossVegas. Clément's design glides over hard-pack, and cuts through grass without skimping on traction. Its unique nail-file tread is short and fine at the center of the tire and gets progressively taller and coarser as it approaches the shoulder knobs. This gradated construction gives you predictable performance as you corner and ride off-camber sections, all the while keeping straight-line rolling resistance as low as possible. LAS has the same side-knob construction as its cyclocross brother the Crusade PDX, giving you superior edge control in leans and a traction advantage coming out of the corner. The Clément LAS Tubular uses Tufo's proven casing with no tube for maximum sealant compatibility. 120 TPI casing. 45-75 recommended PSI. 700c x 33 (UCI legal; 33-622 ISO). 356g. 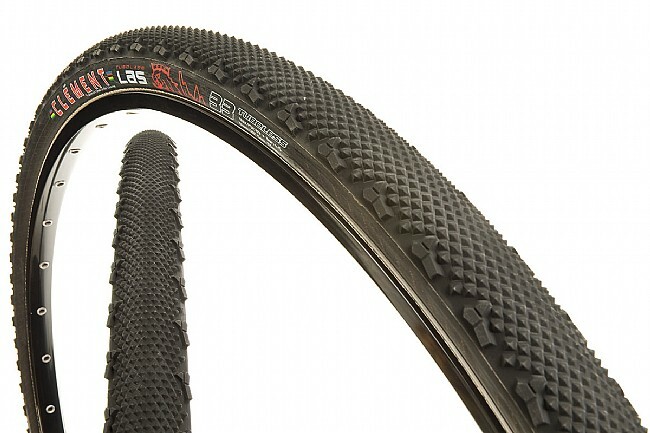 I REALLY like these Clement LAS tires. Apparently they are actually made by Tufo however to a design by Clement, so they have a bit larger side knobs than the Tufo Dry tires. Rolling resistance seems quite low, and although they are obviously heavier than road tubulars, it is amazing how well they go on the road. I raced Battenkill on them after a night of rain, and although I was quite out of shape I could fly by those around me on all the dirt sections. Then I could rest a bit until the group I was with caught back up on pavement. The tires were a big advantage overall and saved me a lot energy on those dirt sections. The only downside for CX racing is that the temptation to use them when you really should be on mud or all-round tires is often irresistible. Best to save them for the obvious dry/fast conditions.